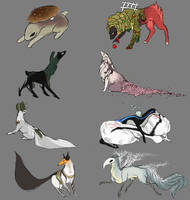 Thank you to AnimeLolwut1470, vlpn, and OnyxUrocyon for allowing me to include their esks! Monday KNOWS THE WAY. You capture her bossiness determination perfectly in this, and the texture and colors are all amazingly done. Thank you so much for including her in your entry! you're very welcome! and thank you, too eue i'm so glad to know you like it!! aaaa! thank you so much!! i actually had more flowers in the.. wildflower field, sigh, but i'm not sure where they went! i'll have to go back and add those when i have the time.